The Sumatran Tiger is the smallest of all surviving tiger species. Male Sumatran tigers average about 300 pounds and females about 200 pounds. Its stripes are narrower than other subspecies of tigers’ stripes, and it has a more bearded and maned appearance, especially the males. The Sumatran Tigers small size makes it easier to move through dense rain forests. It has webbing between its toes that, when spread, makes the tigers very fast swimmers. The Sumatran Tiger is only found naturally in Sumatra, a large island in western Indonesia. Its habitat ranges from lowland forests to sub-mountain and mountain forests, including peat swamp forests. Prey consist primarily of larger ungulates, like Wild boar, Malayan tapir and deer. Conservation Status: Critically endangered. Deforestation resulting from the production of palm oil is a major threat to the Sumatran Tiger. The reserves also do not provide safety, as many tigers are killed by poachers each year despite conservation efforts. 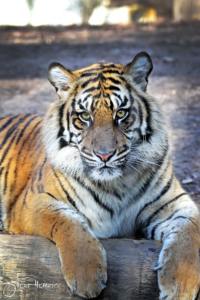 According to the Tiger Information Center and the World Wildlife Fund there are no more than 5oo remaining Sumatran tigers in the wild, with other estimates considerably lower. Sumatran Tigers have been known to drive hoofed prey into the water, especially if the prey animal is a slower swimmer.